Cincinnati Enquirer: "Chalk it up to Bell’s gracious Midwestern upbringing, but Cincinnati was the beneficiary of an extraordinary evening of inspired music making by one of the great violinists of our time." The Tartan: "Steinbacher deftly alternated between choppy, halting notes and blindingly fast runs. The concerto ended on a heart-wrenchingly sweet note, with Steinbacher wringing every ounce of vibrato out of her fingers." Pittsburgh Post-Gazette: "The conductor's balances were keenly drawn again, favoring Steinbacher, who has a lovely timbre, plenty of virtuosity and a gift for lyricism but does not have big sound…The 'Scheherzade' was very mesmerizing, the climax of a great concert with bold conducting and marvelous solos from first chair players, especially concertmaster Noah Bendix-Balgley." The Plain Dealer: "Exquisite details abounded, yes, but only rarely did the violinist truly command attention, opting generally for intimacy and delicacy over boldness. The exception? His cadenzas, creative and appealing flights of fancy, the first of which even included a part for timpani." Roger Wilkie performed the Sibelius Violin Concerto with the Long Beach Symphony Orchestra. 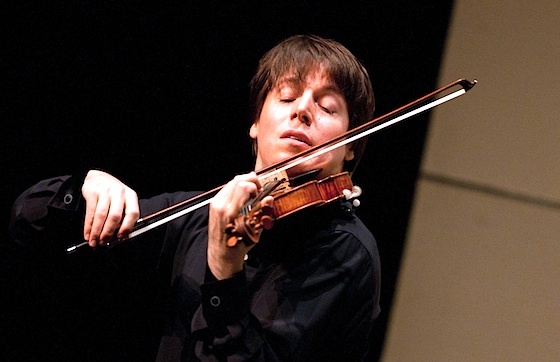 Long Beach Press-Telegram: "Wilkie was immediately at home in the work, which starts with a rich cadenza-like violin passage that soared and sang in seamless passages." New York Times: "What impressed most on Sunday was how well the package coheres — a matter of Ms. Hahn’s smart pacing — and how deftly Ms. Hahn negotiated constant shifts among disparate techniques and moods." In other news, Jennifer Wey joined the Detroit Symphony Orchestra this season as Assistant Concertmaster, and its youngest member, at age 23. Finally, we've made a few tweaks to the commenting system for Violinist.com blog posts. First, we've included links to read and post comments directly from the Violinist.com home page. You no longer need to click through to the individual post's page to read and submit comments. Also, you no longer need to register with Violinist.com to post a comment to a front-page blog. Comments from readers who haven't registered will be held for approval by an editor before going live on the site. And comments from unregistered readers will be identified by their IP address, since they won't be associated with a registration account. Of course, we'd love to have you register with us, and comments from registered members will continue to go live immediately, without having to wait for approval. (And you'll still need to register to participate on the Discussion Board.) But we wanted to make it easier for our new visitors to get started participating in the Violinist.com community immediately.